Are you the type of person who is constantly checking your smartphone to see if anyone has posted on Facebook, Twitter, delete as appropriate? 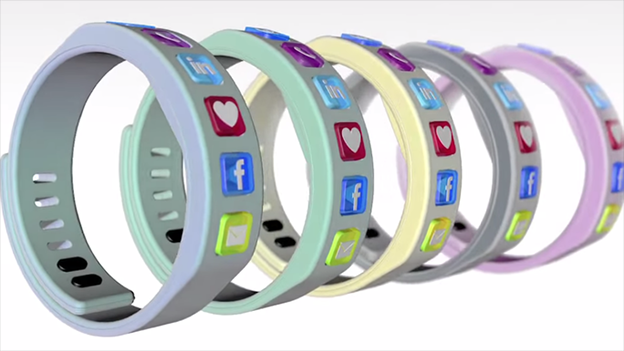 Well there is a new smart wristband in the works that aims to solve that problem. The Hicon is a wearable device that has just been launched on crowdfunding site Indiegogo that aims to keep you up to date with any notifications you may have on one of your social networks. Facebook, Twitter, Instagramn, LinkedIn, Pintrest, Google+ and Whatapp are among the social networks the Hicon can track. Users can choose which networks they want to track, then simply embed the icon into the wristband. Despite that, it is said to be 100 per cent water-proof, sand-proof, and shock-proof. According to its creators, it links to your smartphone via Bluetooth 4.0 LE. Everytime you get a notification, the Hicon will light up and vibrate to let you know. It also has the ability to go off if you get close to someone with another Hicon wristband. Should you choose to eschew the digital approach to friendship and find someone else with a Hicon band, you can send a friend request by simply shaking their hand. It's also possible to set up the wristband to notify you of other things, such as new emails, phone calls and low battery.